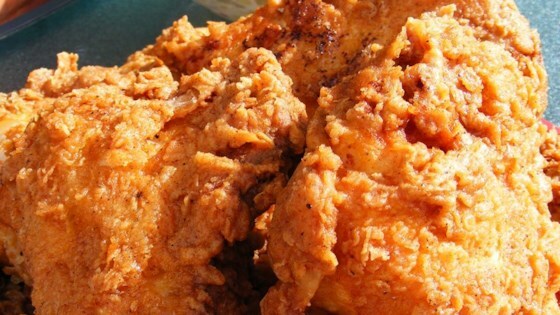 "This is the crispiest, spiciest, homemade fried chicken I have ever tasted! It is equally good served hot or cold and has been a picnic favorite in my family for years." Here is a really easy tip to check the temp of your oil - if you place the tip of a wooden spoon in the oil, and little bubbles form around it, the oil is ready to go. This was GREAT! Finally, I know how to make a chicken coating that doesn't fall off when frying and stays crispy! I even tried this on Chicken Fried Steak and it was delicious!